Before those iPods, before downloading all the music to computers, and even before CDs, we dealt in cassette players. Folks made mix-tapes. The true believers among us had loads and loads of tapes with labels like “slow songs,” “jazz,” “r & b,” “funk,” and too many “rap” ones to count. All those hours of dubbing, recording, selecting, organizing, labeling, and listening were essential for building a really serious collection. It’s clear now more than ever that my colleague Adrian Matejka was one of those true believers. Somewhere in his basement, I imagine, he has a box full of homemade mix-tapes. A couple of days ago, I attended a book release party for Adrian’s volume Mixology at the St. Louis Regional Arts Commission. Mixology is a thought-provoking collection of poems where themes of mixing—musically, racially, culturally, etcetera-lly—persist throughout the work. Adrian’s poems address a wide assortment of subjects, including Public Enemy, Fela Kuti, Spike Lee, Bob Kaufman, Affirmative Action, and basketball. The allusions to this song and that one, the remixes of those historical narratives and these, and the careful selection of particular musical and literary references in Adrian’s book had me thinking that he’s certainly an old school mix-tape producer who does the poetry thing for a day job. The book release party for Mixology was a lively affair with a large group of folks from St. Louis and Edwardsville, as well as poets Allison Joseph and Jon Tribble, who made the drive over from Carbondale. During the event, Adrian read selections from his book, and memorably, for the last one, his daughter Marley joined him at the mic and assisted in presenting the poem. Mixology was chosen by poet Kevin Young as a 2008 winner of the National Poetry Series (NPS). 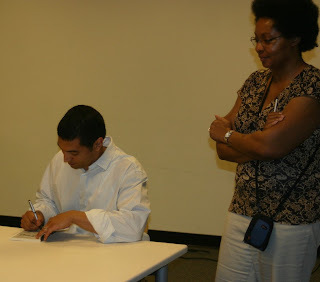 As a NPS recipient, Adrian’s book has links with previous winners such as Tyehimba Jess, Terrance Hayes, and Patricia Smith. It’s also possible to situate Adrian’s work alongside folks like Thomas Sayers Ellis and Major Jackson, two other fairly accomplished poets in his extended circle. But aside from various collections, Mixology stands on its own in many ways as a testament to Adrian’s distinct poetic voice and as evidence of his mix-tape lineage. Matejka brings the invisible man clearly into the reader's vision.